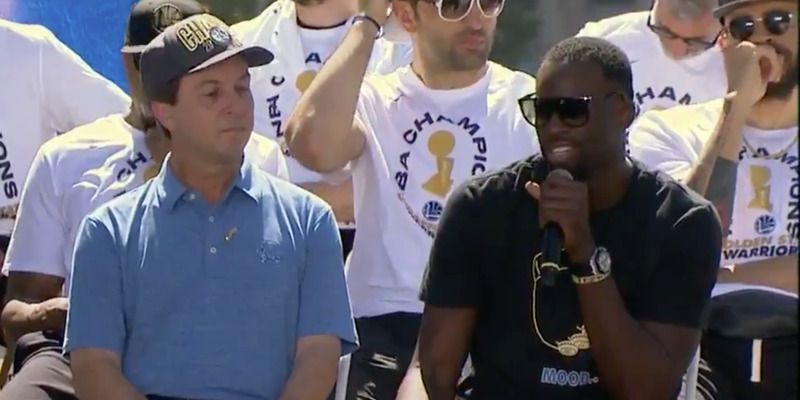 @NBATV / TwitterContinuing a meme-fuelled feud that began back in 2016, Draymond Green once again brilliantly trolled LeBron James during the Golden State Warriors championship parade. Draymond Green continued his trolling of LeBron James at the Golden State Warriors championship parade on Tuesday. Green wore a shirt referencing a meme James had sent out earlier in the season, complete with three championship rings. The ongoing meme war between Green and James dates back to 2016, and all got started with what James claims was a simple coincidence. The Golden State Warriors are NBA champions for the second straight year, and once again celebrating their season with a parade through their city. While the parade is a chance to celebrate and revel in their victory with the fans for most players, for Draymond Green, it also means another opportunity to troll LeBron James. On Tuesday, Green’s shirt contained an outline of the same fist, adorned with three championship rings. The caption read the same. The shirt is just the latest move in a meme-fuelled war between Green and James that’s been ongoing since 2016. It all started when James got off the Cavaliers plane after Cleveland completed their improbable 3-1 comeback over the Warriors in the 2016 NBA Finals. Holding the championship trophy, James wore a shirt featuring the wrestler known as The Ultimate Warrior. While the shirt was ostensibly about a wrestler, many took it to be a not-so-subtle troll of James’ conquered opponents – although James would tell Business Insider that it was not meant to be taken that way, adding that it was just the only clean shirt he had left. The feud might have ended there, had James not doubled-down on his trolling of the Warriors at the Cavaliers Halloween party that year, with decorations mocking Golden State’s blown 3-1 lead. When the Warriors defeated the Cavaliers to win the title in 2017, Green trolled back with a shirt of his own, wearing a shirt that read “Quickie,” with a picture of the Finals trophy – an apparent reference to both the quick five-game series and the Cavs’ home arena, Quicken Loans Arena. When asked about the move, Green admitted it was a direct response to James’ trolling. That move set off what became something of a social media war between the two superstars, leading NBA fans to start picking sides. Now, with another championship ring added to his collection, Green has taken yet another shot at James in this endless off-court battle.